At the moment it would appear as if I’ve abandoned the use of a medium in recent paintings. Let me assure you that it is not a self imposed frugal method of painting. I genuinely think that recent tubes of paint are ‘wetter’ than those of a few years ago. Its all about the handling of the paint. If we leave out the ‘fat over lean’ rule (oilier paint on top of less oily layers), trying to paint on extremely wet under layers is almost impossible. Whether its oil/medium or solvent in the paint mixes, as the paint is applied, what its put down on must be ‘drier’ than the applied paint. For example, if a brush loaded with ‘dryish’ paint, is placed on a wet layer, the brush will lift off the wet paint. For years I used Liquin in the mixes. After working for an hour, the Liquin would begin to get ‘tacky’. Later applications of paint would stick to these layers rather than lift the paint off. Skies, shadow areas, distant objects could be painted over with the lighter tones and highlights, all within two hours. Over the last year, I found using Liquin was not as effective as in previous years. Firstly, I began using a hair dryer to ‘dry’ the under layers of paint containing Liquin. But recently that has not been working. So now I use White Spirits only and when dried with a hair dryer this allows later layers to be applied and not lifted off. This change is consistent with my new tubes of paint replacing the older batches. If you are a painter who allows each layer to dry completely before proceeding, this will not be a problem for you. The one session, or alla prima painters, like myself, need to be able to paint ‘wet on wet’. This is difficult enough without these problems. Anyway, here is the video of this painting. See you soon. 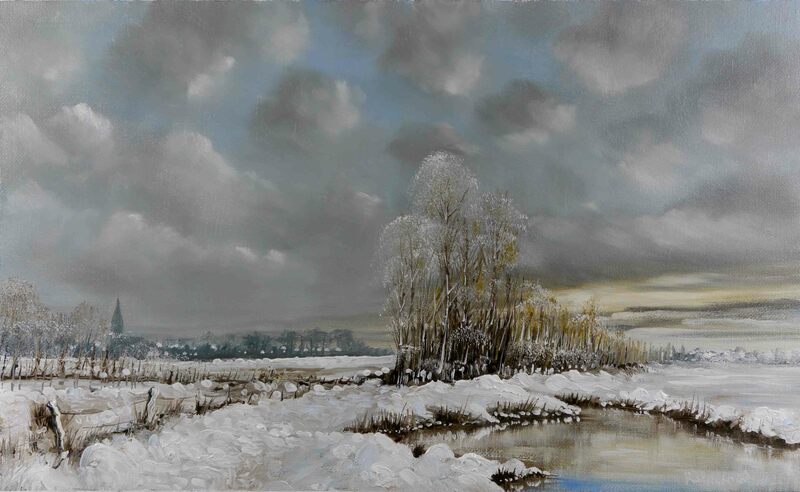 This entry was posted in Oil Painting and tagged Art, Christmas Cards, Culture, Education, Inspiration, Irish landscape, Medium, Oil Painting, Oil Painting Instruction, Oil Painting Landscape, painting, Pictures, Snow Scene, winter. Bookmark the permalink. It is always magical to see your work take shape and come to life. With Winter being my favorite season of the year this image is especially appealing to me. How long does it take you to complete an work of this size (in real time)? Almost everything I do is recorded on video. I apply a 10x speed-up which reduces the time to one tenth of total real time. So this painting took about 150 minutes (15 min x 10). About half of this time is spent just mixing paint.